In Part 1 of this series I introduced you with Less and Sass. In the example you developed in Part 1, you used Node Package Manager (npm) to install Less and Sass. Any package manager basically does the job of pulling requested files from some repository and place them on your local machine. The files under consideration could be binaries (*.dll, *.exe etc. ), source code files (*.js, *.cs etc.) or even documentation files (*.html, *.doc etc.). The files you receive is totally dependent on the "package" you are installing. You might wonder - Do I really need a package manager? Strictly speaking you can develop a project without any package manager. If you manage to grab the files that a package manager is supposed to deliver for you then your job is done. However, this manual approach is tedious for bigger and complex real-world applications. In such a manual approach dependency tracking becomes your responsibility. Consider a simple example. Let's say you need Component A in your application. Component A, however, needs component B and component C for its functioning. As a consumer of C you may not be aware of these dependencies and may forget to grab B and C. Obviously, your application won't work as expected. Consider another example. Let's say your web application needs jQuery, KnockoutJS and TypeScript libraries. In a manual approach you typically visit all the relevant websites and then download the respective libraries. Modern web applications often many client side libraries and this manual downloading might be tedious. A package manage helps you in the situations just described. By using a package manager you can grab all the required files without leaving your working directory or project. While working with modern ASP.NET applications you will come across three package managers namely NuGet, Npm and Bower. Although all of them are package managers each is designed with some specific needs in mind and handles a specific requirement better than others. Now that you know what a package manager is, let's discuss each of them in bit more details. 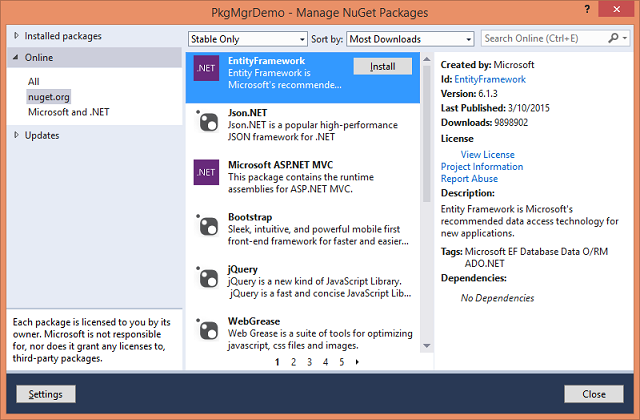 NuGet is a package manager that primarily deals with .NET assemblies. Main driving force behind NuGet is Microsoft and .NET community. For example, if you wish to get the latest version of Entity Framework or ASP.NET Identity you can use NuGet to add it to your project. The NuGet official gallery nuget.org acts as a catalog of NuGet packages. When you install a package using NuGet you are grabbing them from this gallery and placing them into a local folder. 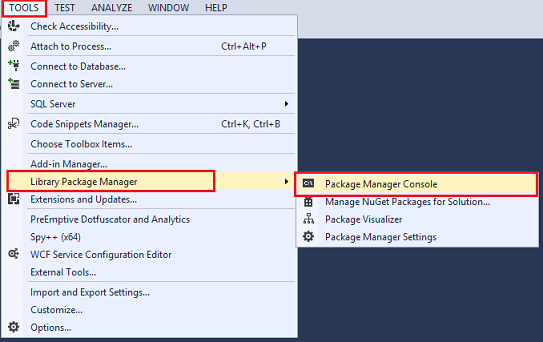 NuGet package manager is available in two flavors - Command Line version and integrated with Visual Studio. The later flavor is more common because it is nicely integrated in the Visual Studio IDE. In the examples that follow I will use this flavor to illustrate the NuGet usage. You can invoke the NuGet package manager console in Visual Studio using Tools > Library Package Manager > Package Manager Console menu option. You can now issue commands at the PM prompt. They are added to the BIN folder of your project and a reference to them appears under References folder. A folder named Packages is created (if it doesn't exists) in the Solution's folder and a the downloaded files are placed under Packages in their own folder. The Packages.config file can be used to reinstall (Update-Package -reinstall ) all the packages if something goes wrong. Node package manager or npm is primarily designed to install Node.js modules. You can also use npm to install packages that are used during development time. For example, CoffeeScript and TypeScript. The catalog for npm packages is located at npmjs.com. Main driving force behind npm is Node.js community. Node package manager comes as a part of Node.js installation. You can download Node.js here. Once installed npm can be invoked using Command Prompt. This command grabs the required files from the npm repository and stores them in Node_Modules folder the Visual Studio project folder. 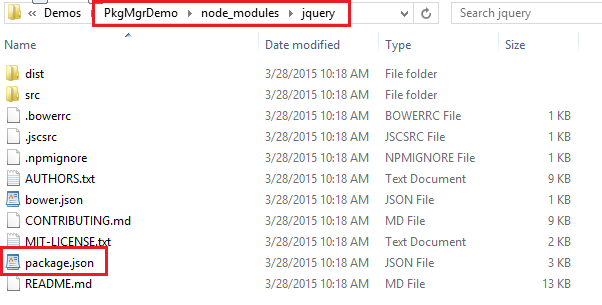 The jquery folder will have all the files including licensing information and support files. So, now you have jQuery installed locally. How should you reference it from your web pages? One straightforward way is to point the src attribute of the <script> elements directly to jquery.js from the above folder. However, personally I avoid this approach. What I prefer is to copy just the required files from Node_Modules > jQuery folder to some other folder within the Visual Studio project (say Scripts folder). But this is a matter of personal choice. Note that unlike NuGet which stores package information in XML format, Npm stores the information in JSON format. If you wish to remove or update a package from the global repository then include -g in the corresponding commands. 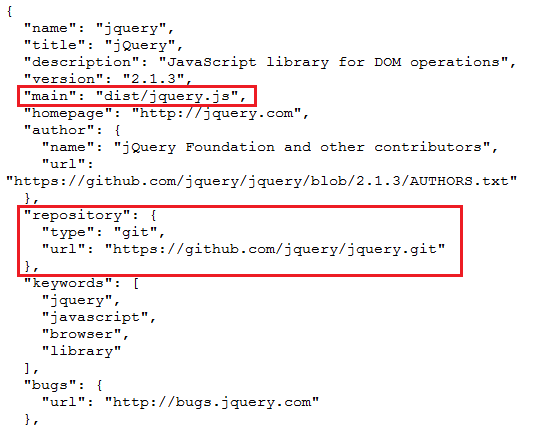 As you can see you modified the dependencies section to include three entries - jquery (any ver. 2.x.x), jquery-mobile (any ver. 1.x.x) and jquery-ui (any ver. 1.x.x). Doing so will read the Package.json file you just created and will install all the three packages listed there. they will alter the dependencies section to the same values if you would have done manually. If you ever need to restore all the packages used in a project you can now simply invoke npm install command and all the packages listed in this file will be listed for you. Now that you are familiar with NuGet and Npm, let's discuss Bower. Bower is a package manager primarily for front-end packages. By front-end packages I mean the packages that you use in your web pages such as JS libraries and CSS files. One main difference between Npm and Bower is that Npm supports nested dependency trees whereas Bower uses flat structure (you need to resolve the dependencies yourself). In other words Npm may result in multiple versions of a component on your machine whereas Bower will always keep one version of a component. In this article I won't discuss these differences in more details because that's not the topic of this article. Notice the -g switch that installs Bower package in the global repository (see our earlier discussion). Bower pulls all the required files from Git repositories. So, you will also need some git client for windows. You can download one here. Make sure that whatever client you use supports command line mode. All bower packages are stored inside Bower_Components folder. Each package also has Bower.json file describing the package in addition to content files. As you can see this file is quite similar to Package.json of Npm. Once a package is installed you can either reference the files directly from Bower_Components folder or copy them in some separate location and then reference them from your web pages. As mentioned earlier I prefer the later approach. 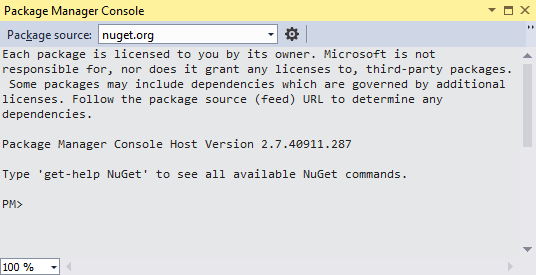 NuGet is primarily for installing .NET assemblies (compiled server side components). 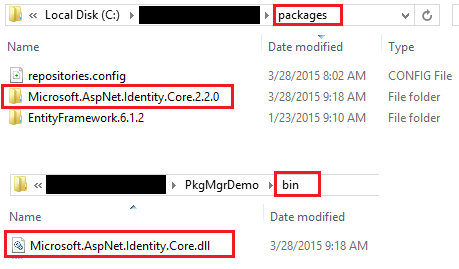 NuGet puts the package content in your project (typically Bin folder) and inside Packages folder under the solution folder. Packages.config file (XML format) lists all the NuGet packages installed in a project. Npm is primarily for Node.js packages and packages such as CoffeeScript or TypeScript that you use during development but that are not directly referenced from the web pages. Npm stores packages under Node_Modules folder (local repository) or inside C:\Users\<user>\AppData\Roaming\npm\node_modules folder (global repository). Each Npm package has Package.json file (JSON format) describing that package. You can also create a project wide Package.json file yourself. Bower is primarily for installing front-end packages - the packages that are directly referenced from the web pages. Bower stores packages under Bower_Components folder (local repository). Each Bower package has Bower.json file (JSON format) describing that package. You can also create a project wide Bower.json file yourself. Files from local Node_Modules and Bower_Components folders can be copied to some other project folder and then used from within your application. That's it for now! Will be back with the next installment soon.